The purchase of golf clubs is deductible if you can show that your golf is a business. In most cases, the cost of golf clubs is not a deductible tax expense. However, if you can prove to the Internal Revenue Service that your golf activity is a trade or business entered into for profit, you may be able to deduct the cost of your golf clubs as a business expense. The tax code allows deductions for “ordinary and necessary business expenses.” A golfer on the professional tour is obviously playing golf with the intent of making a profit. He doesn’t have to actually make money as long as he intends to do so. This qualifies his golf as a trade or business and allows him to deduct the cost of his golf clubs along with any other expenses necessary for him to play. A golf instructor may or may not deduct the cost of her golf clubs. She would have to prove that her clubs are necessary to the conduct of her teaching business. 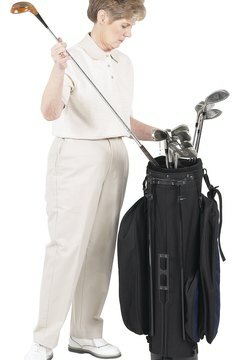 Even if her students don’t use her clubs, she may be able to show that she needs the clubs to keep her skills sharp, which would allow her to deduct their cost. If you play golf for money, even though not as a touring pro, you may be able to argue that your golf is a business from which you intend to make a profit. If you do actually make money playing golf, and your winnings exceed your costs, including the cost of your golf membership and equipment, you may be able to deduct the cost of your golf clubs. You must report your winnings on your tax return and show a profit in some years. The tax laws generally treat activities that don’t show a profit in any of five years as a hobby rather than as a business, which makes all costs nondeductible. The tax laws are also rather harsh on gambling, and proving that gambling activity is a business can be very difficult. One sure way to deduct the value of your golf clubs is to give them to a charitable organization. Your deduction will be limited to the value of your clubs when you make the contribution rather than their cost, but you will get a deduction for your golf clubs. You just won’t have them any more.